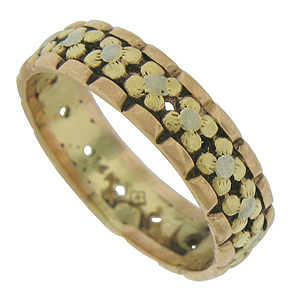 This Retro Modern wedding band features a string of yellow gold posies punctuated by white gold faces. Scalloped bands of rose gold frame the floral center. 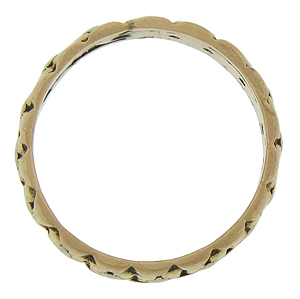 The vintage wedding ring is fashioned of 14K yellow, white and rose gold and measures 5.21 mm in width. Circa: 1940. Size 7 1/4. We cannot re-size.